What is Git? What do you imagine Git to be? The last step with create a hidden .git/ folder where all the Git data will be stored. Staging refers to the action of making files ready for commit. A commit is version of your project. When you complete some part of the work, you commit! git commit -m "message about what happened in that commit" creates a version or commit of your project. A accompanying message describes what happen in that commit. Warning: those changes will be lost! This command will detach the HEAD (like the reading head of a K7) from the latest commit. In other words, it will let you go back in time to a previous commit. To keep it simple, you can't do much there, but look around, copy content from files and save them in new (untracked) files. 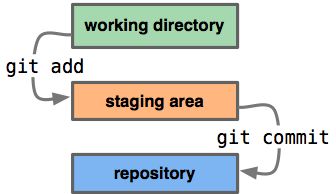 Git facilitates the coordination of contributions from different collaborators in a project. Each contributor has a local repository, that is a 'clone' of the remote repository. The remote repository acts as the central node from which all the users will receive - pull - and send - push contributions. (Note: This step only needs to be performed by the admin, whom will usually set a remote in the local repository). To clone the remote git needs an authentication from its users, usually using ssh keys. ssh key pairs (a public and private key) is an authentication method for clients to access servers through ssh. E.g. For my computer to ssh to pzwart1. we are ready to clone, push and pull to the remote. This page was last edited on 8 February 2017, at 21:12.